I am a priest who has been asked to celebrate Mass in the context of a medieval re-enactment event (the Society for Creative Anachronism). A friend has offered to consider making period vestments for the occasion. 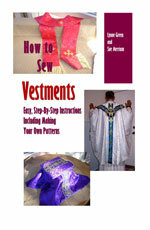 Do you have patterns for vestments suitable for twelfth century Northern Europe? Vestments in the 12th century were similar in type to modern day Gothic vestments, but had far more ornate embroidery. According to Herbert Norris, author of Church Vestments: Their Origin & Development, from the 12th to the 14th century was the period of English Church embroidery. Although I realize you wanted Northern Europe, I suspect the design was similar throughout Europe, but I'm certainly no expert on this.